There are a lot of people who work a lot and are in a hurry, but get really stuck on what to do for a quick protein to eat every 3-4 hours throughout the day. I have written a lot about protein ideas, such as eggs, low-fat cheese, nuts (measured), low-carb protein bars, low-carb and high protein shakes, and different meats. Sometimes people want a patty or a burger (without the bun). Trader Joe’s (and other stores) have plenty of frozen foods that are a great selection for low-carb and high protein foods. 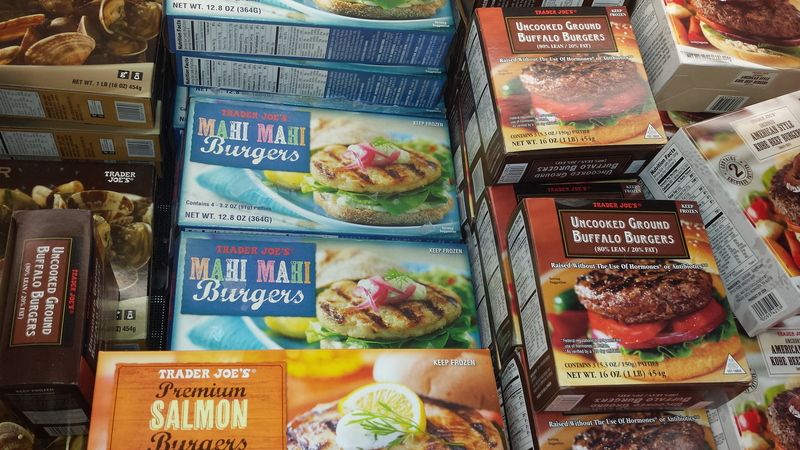 I have seen beef burgers, buffalo burgers, turkey burgers, chicken burgers and even Mahi-Mahi burgers. These foods can be served with vegetables and it is like having a delish cooked food, but it can be grilled quickly or even microwaved because they are cooked and frozen and ready to go. I have had them. YUMMY! In a quick amount of time, you can have a good lunch or dinner meal. Kids and adults can enjoy them. Yes, there is sodium in them to freeze them, and are not as “healthy” as a fresh piece, but you will not be doing it daily and you sometimes need this because they are good for a DIET. They are extremely low-carb–barely 1 or 2 carbs per item. Check out the boxes next time you are shopping.